The bombing campaigns of Arc Light, Linebacker, Linebacker II, among other campaigns ended up dropping a huge amount of ordinance in SE Asia. It is not confined to Vietnam, as we ran "secret" wars in Laos and Cambodia, since the Vietnamese were using these countries as part of the Ho Chi Minh Trail. 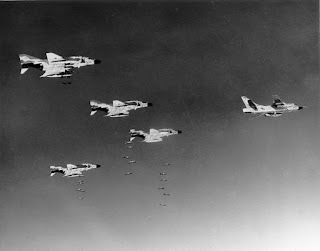 Although we dropped enough bombs to flatten Europe and Japan several times, the results of the campaigns were often less than successful. In terms of sheer power, the United States did a number of things in Vietnam. 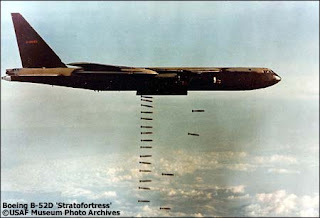 They effectively converted the B 52 into a conventional bomber from its original role as a nuclear strike weapon. In fact the bomber is still operational in the Air Force, and it is still bombing things in Afghanistan. The bigger question is proportionality. This was outlined in The Fog of War. Whether or not we think of the Vietnam War as a proportional is up to debate. What is clear is that we have not accounted for all the ordinance dropped, several decades later.